Mini Blinds, we all own them and we all loath them. No one wants to spend a few days removing the dust from them, but we also don’t want them to turn grey with the seasons. 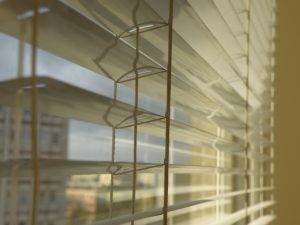 Regardless of what you may think, it doesn’t always have to be this way, there are many ways to clean blinds. Dusting: First off, it will probably seem obvious, but you should close the slats prior to dusting.Weekly blind dusting is the best way to go, using a lamb’s wool duster, as lamb’s wool will naturally attract dust and can help prevent buildup as well. If lamb’s wool isn’t available, a paintbrush may also do the trick. Make sure you place some towels underneath the blinds to catch any excess dust. Deep Clean: If you want to be thorough, you can also take the blinds down and clean them in your bathtub.To remove the grease from the blinds, an all purpose cleaner can be used. Spray the blinds good, then let the cleaner work on them for a few minutes. Then, wipe the cleaner off with a soft cloth, although rinsing the cloth will make it even more effective. To clean the other side of the blinds, flip it over and do the same thing as mentioned above. Thorough & Simple Cleaning: simply use an old pair of cotton gloves to clean your blinds. Slip the gloves on, dip your fingers into a solution of 1 teaspoon ammonia and 1 quart water, then run your fingers through the mini blinds. Vacuum: If you prefer, you can also use the vacuum cleaner hose attachments. You can even use the vacuum cleaner without having to remove the blinds. Putting a dryer sheet on the blinds will remove any static so that dust will no longer be attracted to the blinds. Cleaning mini blinds can seem daunting but with so many options on how to clean them you can always find a method that works best for you. And if you don’t want to clean them or spend your time giving your blinds a bath then there is always the fifth option, hiring someone to do it for you. Here at Tidy Up we’re happy to do your cleaning, including your blinds, contact us today for your free quote. cleaning mini blinds, house cleaning Calgary, maid services Calgary, residential cleaning. Bookmark. Hi, this is nice article, I enjoyed it. Thank you for sharing !